The next leg of the trip begins. Mom has decided to take a break. 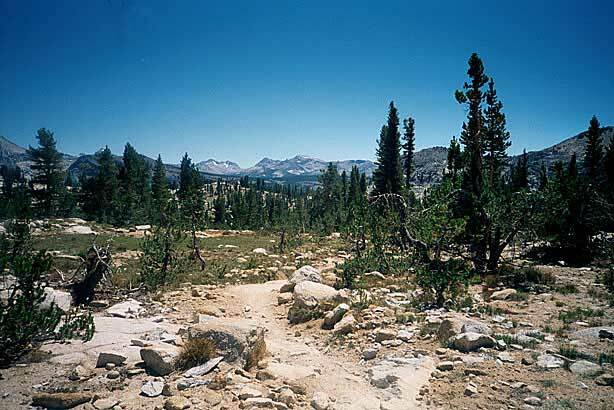 She'll be meeting me at Tuolumne Meadows, some eight days distant. With no one to yap to on the trail I have to find another way to express myself. All the things I observe and experience and stub my toe against can't be shared without a hiking partner. So it all gets poured into the journal. Expect many words. And feel free to skip them if you want. I would. The absence of a hiking partner also takes its toll on the quality of the pictures, as it's my belief that photos with people in them tend to be superior. Particularly if they're doing something embarrassing. So unless I had time to balance Mom's camera on something and sprint to a casual pose in front of it (see above) I took a number of trail shots. When possible, in order to make things more interesting, I've pointed out interesting landmarks. but that, unfortunately, was not always possible. the famous sign at Vermilion. Alas, I have spilt water upon this meager journal, wrecking it's solid, wholesome appearance. On the way up to Pocket Meadow now. Mono Pass junction just ahead. The creek from Silver Pass tumbles by just out of sight. So far, so good. The loneliness has not hit yet. Maybe it won't. there seem to be many people on the trail. Just shook hands with Dennis and Holly, an attractive, energetic couple I just ran into on the trail above the first rough set of switchbacks. He works at PG&E. She's at Cal Poly San Luis. Our conversation just gobbled up the stretch of trail to the Silver Pass/Mott Lake junction. I don't even remember what it looked like. 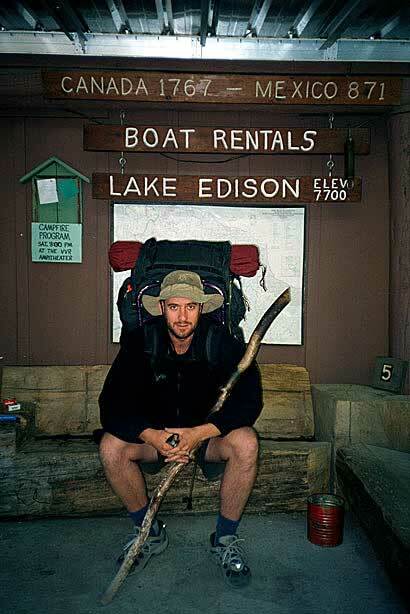 We chatted about bears, trails, Virginia Lake (now I'm conflicted about which route to take again) and bear canisters. Your typical trail conversation, actually. Nice people. Now they're gone. Looking above the trail. This section is apparently quite dangerous in the spring. Looking back toward Pocket Meadow.It's in there somewhere. Looking up trail. 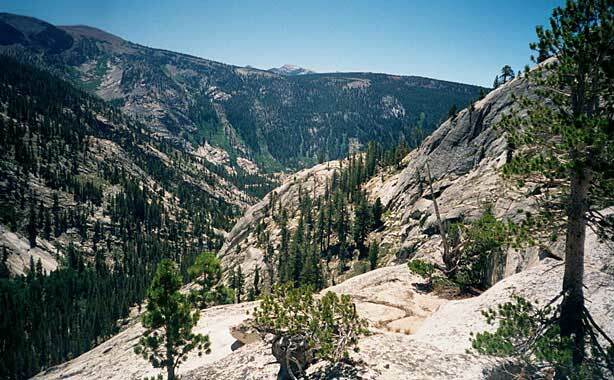 Bear Ridge spans the background, with its innumerable switchbacks. On the approach to Silver Pass. Crystal blue sky. Stiff, cold breeze from behind. I can see the pass ahead. Stupidly, the trail ascends to a spot quite higher than the actual low point. I'm sure the little trail elves had good reasons for this. I can't see them from down here. 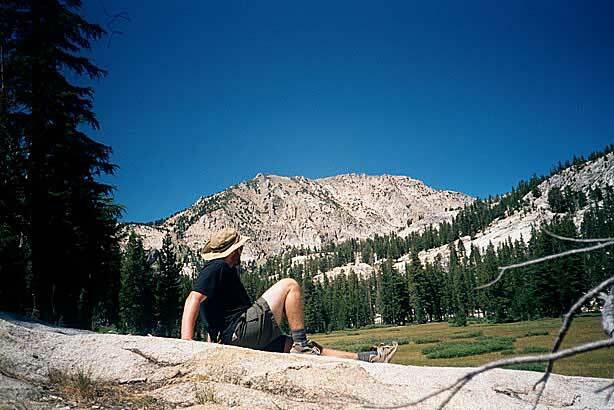 I had lunch at the end of a beautiful meadow just after arriving in the Silver Pass Basin. Took a picture or two and then moved on. I was sorely tempted to camp on that side of the pass, but something kept me moving. Moving through the haze of breathlessness and muscle pain that settled in after the break. 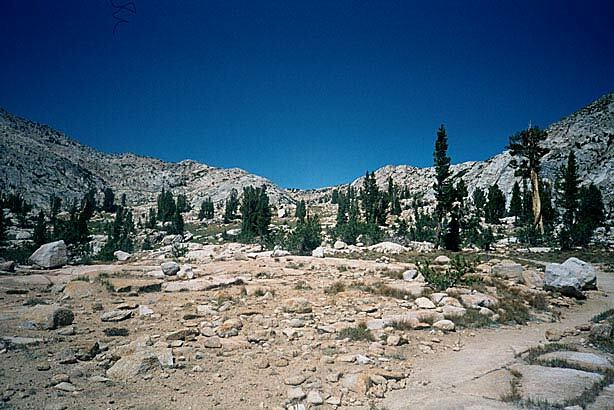 I toiled up the hill (making that brief entry just before) and crested the pass. 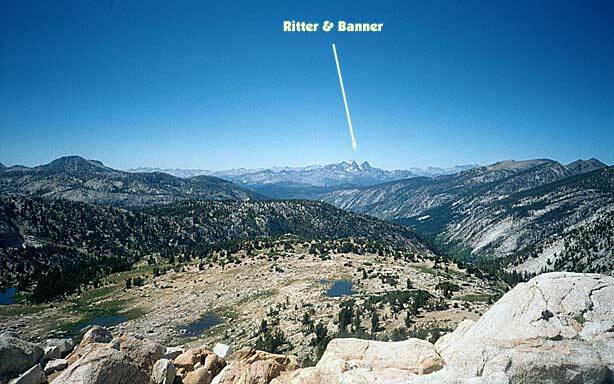 I took a picture of the world's most decrepit trail sign then went up to take in my first glorious views of Banner & Ritter. And then looking the other way, the Seven Gables marched in series, hazy in the distance. And far more dramatic than I'd seen them yet. Selden Pass was somewhere up there. I couldn't make it out, even with binoculars and a wind-blown map. I think the loneliness of the day peaked on that pass. It was the first pass of the trip that shared with absolutely no one. A vacant stretch of granite. No one for miles in either direction. My lunch spot after the climb out of the canyon. Gorgeous. On the way toward Silver Pass. It's just a peak. But I liked it. 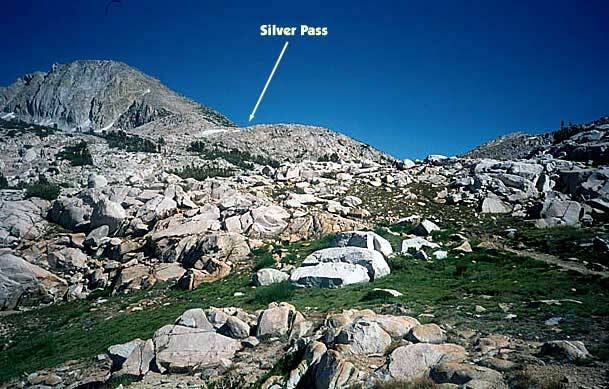 ...And then looking ahead at Silver Pass. See it? 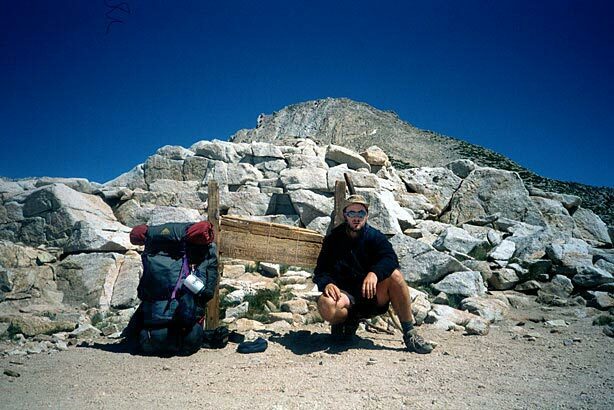 I choked down a bit of trail mix, had the rest of the three hard-boiled eggs I picked up at resupply and headed down, happy at least that I could see where the end of the trip was. Or at least a "banner" indicating its final stretch. . The world's most decrepit trail sign. Looking North. Banner & Ritter at last!! 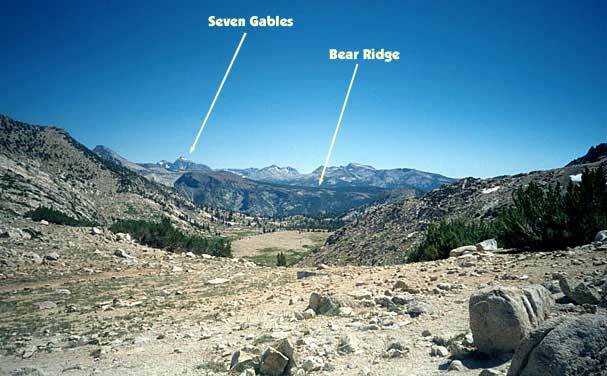 Looking South at Seven Gables and Bear Ridge (labeled). North of Silver Pass looking back up. I'm down below the "Native American Basin" at the moment, which is as good a name as any for that are below the pass where sit those bodies bearing names like Papoose Lake, Squaw Lake, Chief Lake and Lake of the Lone Indian. I've come about ten and a half miles today. There's less than a mile to Fish Creek. There I'll have to make my decision. Up or down? 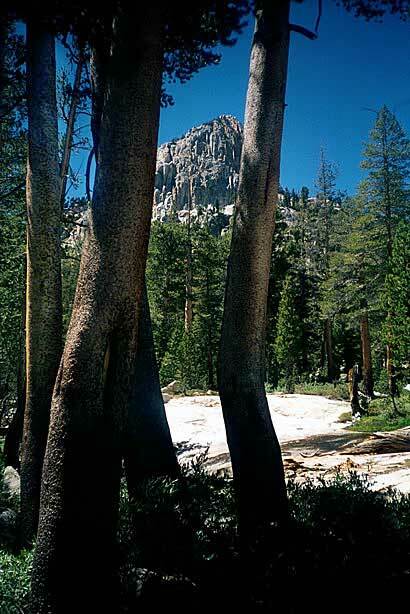 JMT or side trip? The sun hid early. I washed up, cooked dinner (a rather tasteless mash of black beans, brown rice and corn tortillas--half of which eventually became the bed upon which I built tonight's campfire,) and have taken a seat by a crackling blaze, journal in hand. I'm constantly thirsty, though I'm not dehydrated. The mosquitoes are a bother, but not a nightmare. I did a little examination of the map. 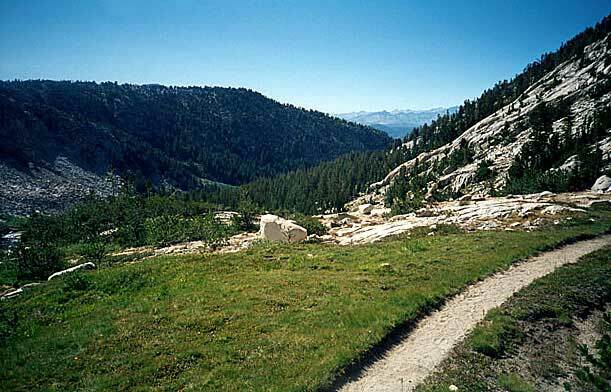 Unless I want to hang around Tuolumne Meadows for a two days, I'll have to keep a more mellow pace than this. 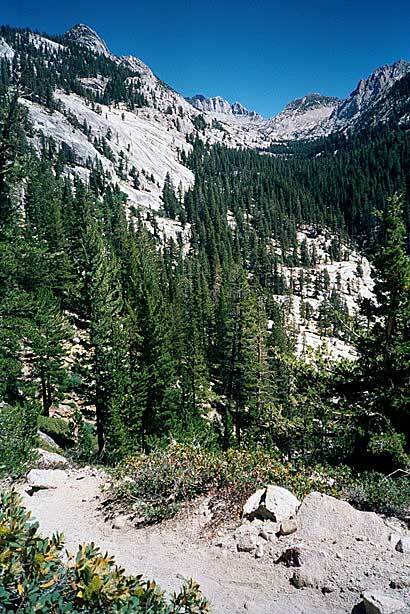 I'm thinking of going to Purple Lake tomorrow (provided I don't turn left at the fork) then Crater Meadow, then Trinity Lakes, Garnet Lake, Rush Creek, Lyell Canyon, and. then what? Further down Lyell? 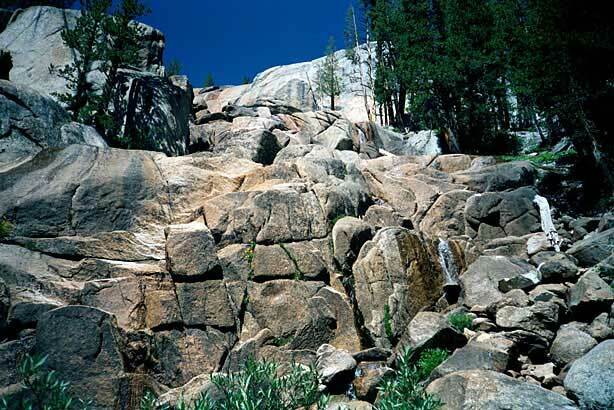 Or should I just go to Tuolumne and have a layover day there? I could do that. Nicely. I think I may be short a dinner anyway, having perhaps built a fire on en extra night's vittles. The fire's burning down. I think I'll let it go out (though not without a prod or two in the coals to make sure there's nothing left of dinner) and crawl in the tent. Henry Miller beckons.